The Sicilian kitchen is all about using the seasonal items available from the land– the fresher, the better. This time of year, fruits, vegetables and spices are in full bloom, and nothing beats using a fresh tomatoes, garlic, and basil combination from the garden. That’s what we do in Episode 12, where we share with you pasta con aglia or in the Sicilian dialect I grew up calling this dish, pasta cu aglia. In English, it’s simply pasta with garlic. 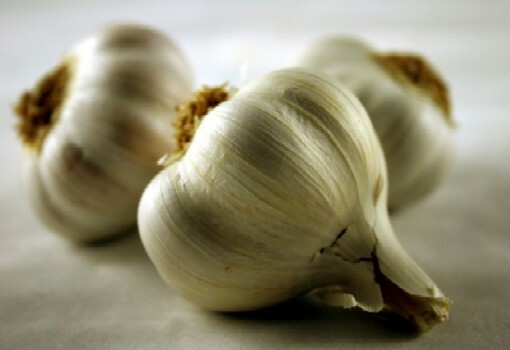 There is perhaps no other ingredient more Italian than garlic, which is healthy and tasty. I grew up on the stuff, and raised my kids on it as well. I use it in so many dishes, and pasta con aglia really emphasizes its flavor and beauty as an ingredient. This is a dish that’s very quick to prepare (about 10 minutes), which is why my mother used to make when someone stopped by unexpectedly (unexpected guests were always welcome and fed well) and she needed to pull something together quickly. She used to make it for large family gatherings as well since it was so easy to prepare and did not require lots of work. Pasta con aglia is very healthy, and not too heavy– perfect for the summer time. I highly recommend giving this recipe a try, and eating it outside under the beautiful sun with a glass of wine. The ingredients you will need for the pasta con aglia are: 14 ounces of fresh, crushed tomatoes, 4 large cloves of garlic, about 1-1 1/2 teaspoons of salt, a handful of fresh basil, and about 3 tablespoons of olive oil. You will also need a mortar and pestle which you will need to crush the mix. You can use fresh tomatoes from the garden or fresh whole tomatoes in a can (I like Kitchen Ready brand), which is what I do when I don’t have fresh garden tomatoes to work with. Start off by crushing the tomatoes in a bowl. Place them aside. Next, take the four, large peeled cloves of garlic and slice them up into the mortar bowl. Add more garlic if you like lots of garlic and want a stronger flavor. This is pasta with garlic after all! (Just don’t plan on kissing your significant other for the evening if you do use extra garlic!). Use the pestle to crush the garlic. Crush until it’s mashed into a small pieces. Add the salt, and continue to crush. Once crushed down, chop up the fresh basil, and add that to the mortar bowl. Crush the basil. Once it’s in a fine paste, add the olive oil, and mix. Take the mixture, and add it to the crushed tomatoes. Mix with a spoon. While you’re preparing the sauce, you can cook the pasta. Follow our directions for cooking pasta, making sure you keep it al dente. The classic pasta to use with this recipe is spaghetti. You can use another pasta if you’d like, but I’d stick with long pasta, such as fettucini, if you do substitute for the spaghetti. Before draining the pasta, use a scoop to take some of the water from the pasta and place it aside. You will use this water to add to the pasta mix when completed. Once you’ve drained the pasta, place it in the pan you cooked it in, then add the sauce. Mix thoroughly. The pasta will absorb the sauce, so you should add some of the water you took from the pasta into the mix. This will help make a nice “juice” with the sauce– something you can dip fresh bread into! That’s it! You are ready to serve! Get your family and friends together, place a large plate of pasta in a bowl, add some grated percorino romano or parmesan cheese on top, and mangia! 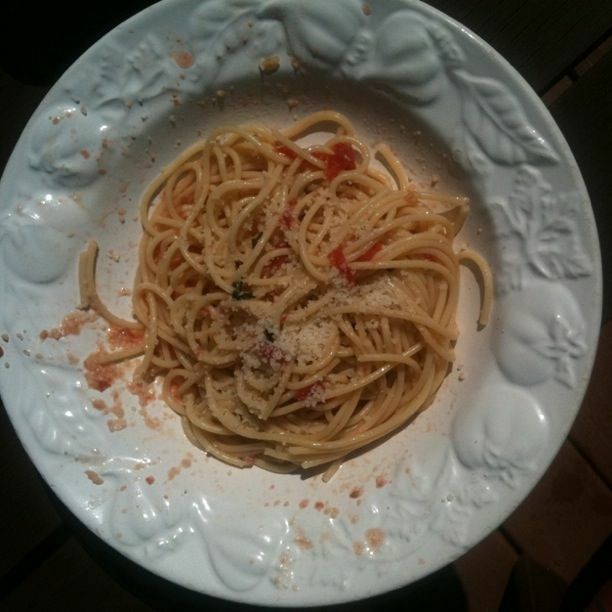 This entry was posted in Pasta (i primi) and tagged basil, garlic, pasta con aglia. Bookmark the permalink.